Merry Christmas from Laughing Frog Images! This year’s card takes us back to February of 2003, and the early days of the Western New York and Pennsylvania (WNY&P) Railroad. 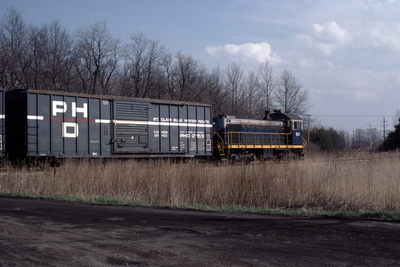 The WNY&P is a part of the Livonia Avon and Lakeville (LA&L) family of railroads. We’re at Niobe Junction, New York on this brisk February morning to see two LA&L Alco C424m’s heading west to Corry, PA on the former Norfolk Southern / Conrail / Erie Lackawanna / Erie Railroad mainline. Anyway, on this fine February morning, we see two spotless Alcos, each 35+ years young (and still around today! 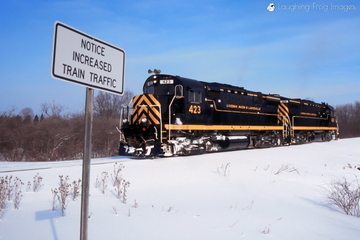 ), heading west to Corry, PA.
They’re passing an unusual sign warning drivers of “increased train traffic”, as the WNY&P is about to resume through freight service on the line between Meadville, PA and Hornell, NY. Why were they headed to Corry as light engines? A customer in Corry had a slight problem. A freight car was stuck – as in frozen stiff, and it needed to be moved. The two Centuries headed west from the terminal in Falconer, NY, freed the car for the customer, and headed home. That’s customer service by the WNY&P in the spirit of the Erie Lackawanna’s “Friendly Service Route”! I discovered the Port Huron & Detroit Railroad with a forgotten cohort in July of 1982. An Alco-powered shortline in Michigan, the Port Huron & Detroit was something new to me. Alco switchers were all but gone in Western Pennsylvania. And the folks there put up with, educated, tolerated, and supported a young railroad photographer. I was shooting Kodachrome 64 – each slide cost me just shy of a quarter for film, postage and processing. I was making $4-5 dollars an hour through various summer enterprises. And I lived about 300 miles away. 30+ years later, I wish I’d shot more… I have too many memories of the people that made the railroad what it was, and too few pictures of them. Back then, I was still mastering Kodachrome, let along photography in general. After working the scanner for hours, it’s been hours of cleaning, editing, and fixing. The PH&D gallery can be found on Laughing Frog Images by clicking here. The Frog is working on a black and white Port Huron & Detroit gallery – hopefully it will be up before Thanksgiving. Port Huron was also served by the Grand Trunk Western and Chessie System (former Chesapeake and Ohio, and before that, Pere Marquette). The Chessie line was still referred to as the “PM”, and had a carfloat operation to Sarnia, Ontario that I never shot… (Yes, I regret it – but the lighting was bad in the morning, and by the time the light came around, I was chasing the PH&D.) You could drive in to the Trunk’s engine facility, check in – and as long as you stayed off of the tracks and engines – and didn’t do anything stupid, all was well. 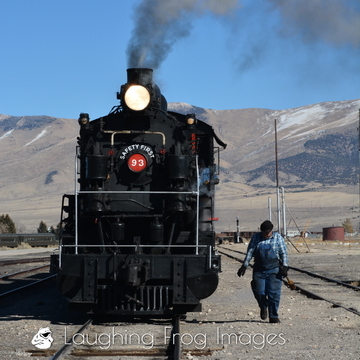 Look for future blog posts and galleries from these railroads I came to know because of the PH&D. The Port Huron & Detroit Railroad Historical Society’s Facebook Page can be found here. Half of all profits from this gallery will be donated to the Port Huron & Detroit Historical Society.